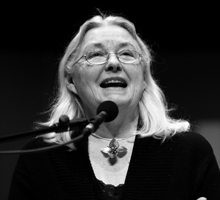 Gillian Clarke - Poetry Live! Gillian Clarke is a Welsh poet who writes in English. She was brought up in a Welsh family in Cardiff and although she now speaks fluent Welsh her upbringing was English-speaking. She now lives on a small farm in the wild countryside of Ceredigion (west Wales) with her husband who is an architect. They look after a flock of sheep and an assortment of smaller animals. Gillian’s three children, Catrin, Owain and Dylan are now adults. She wrote poetry at school but was discouraged at university. Her first published poem was The Sundial which was rescued from the waste-paper bin by her first husband and sent to a poetry magazine. In 1971 her first collection was published. Apart from writing poetry, with a number of much acclaimed collections, she also translates poetry from Welsh, she has been a distinguished literary editor, a playwright, president of the north Wales creative writing centre, Tŷ Newydd and devotes a considerable amount of time to poetry in schools. In 2008, she became National Poet for Wales, in 2010 she was awarded the Queen’s Gold Medal for Poetry, and in 2011 she was made a member of the Gorsedd of Bards. Her latest collection, Ice, has been shortlisted for the 2012 TS Eliot Prize.